Tehran: Iran issued a new warning over Mideast oil supplies as the United Arab Emirates said on Tuesday it could increase its own production, the latest remarks to follow President Donald Trump's demand for lower global energy prices. The comments by Iranian President Hassan Rouhani and the unexpected announcement by the UAE's oil-rich capital Abu Dhabi came as U.S. benchmark crude traded around $75 a barrel. A recent decision by the Organization of the Petroleum Exporting Countries to increase the cartel's own production by 1 million barrels a day has yet to tamp down prices. That's led to higher prices at gasoline pumps in the United States as it heads toward midterm elections for Congress. The U.S. pulled out of the Iran nuclear deal in May and initially said it wanted allies to stop buying Iranian crude entirely. The State Department said Monday it would examine waivers on a "case-by-case basis" as it re-imposes sanctions. 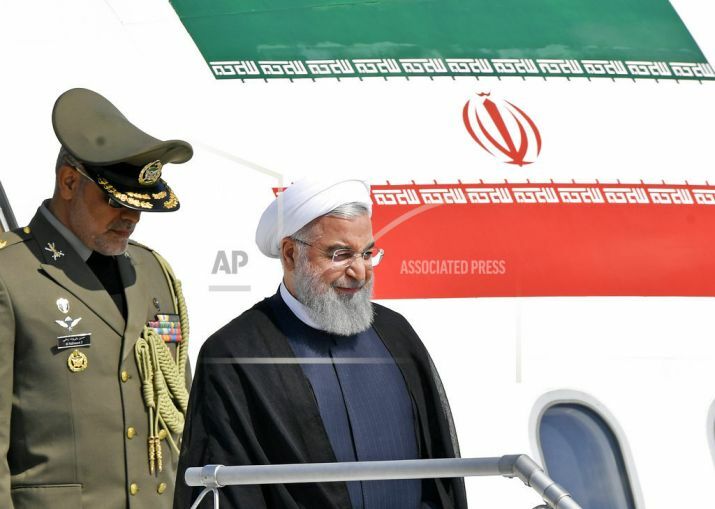 Rouhani did not elaborate, but Iran long has asserted it could shut down the Strait of Hormuz, the narrow body of water that separates the Persian Gulf from the wider world. A third of all oil traded by sea passes through the strait and the U.S. Navy regularly has direct, tense encounters with Iran's paramilitary Revolutionary Guard there. The U.S. Navy's 5th Fleet, which patrols the region, has said it has not seen any "unsafe and unprofessional" actions by Iranian naval forces in the Persian Gulf since August 2017. It did not immediately respond to a request for comment Tuesday over Rouhani's remarks. Separately, Iran's Interior Minister Abdolreza Rahmani Fazli warned Tuesday that "if we close our eyes for 24 hours, 1 million refugees will go toward Europe through our Western borders" via Turkey. Some 5,000 tons of narcotics also could be smuggled to the West, he added, according to the semi-official Fars news agency. Iran lies on a major trafficking route between Afghanistan and Europe, as well as the Persian Gulf states. Large drug seizures are common across the region. Meanwhile, the state-run Abu Dhabi National Oil Co. issued a surprise statement Tuesday saying it has an oil production capacity of 3.3 million barrels per day. It added that it "remains on track to increase its production capacity to 3.5 million (barrels per day) by the end of 2018." The UAE, an American-allied federation of seven sheikhdoms on the Arabian Peninsula, hosts some 5,000 U.S. troops. Dubai also is the U.S. Navy's busiest port of call abroad. Its statement Tuesday comes as Trump increasingly has criticized OPEC for not doing enough to lower oil prices. On Saturday, Trump wrote on Twitter that he had received assurances from King Salman of Saudi Arabia that the kingdom will increase oil production, "maybe up to 2,000,000 barrels" in response to turmoil in Iran and Venezuela. The White House later seemed to walk back on Trump's tweet.